A little earlier than usual today thanks to Veterans Day. I was right about Missouri thankfully. Maybe they were distracted with their pending protest over nothing; but along with Kentucky, they don’t seem very focused on football at this point. 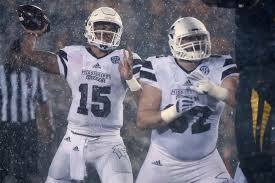 Dak Prescott had a successful game despite the rain in Columbia but will have a different challenge when the Bulldogs host the Tide. I was also right about Kentucky going downhill worse than Georgia. Florida was a miserable failure in the point spread department, but at least the Gators won. I don’t know how you beat Ole Miss by 14 times the amount you beat Vandy, but that’s college football. Speaking of Ole Miss, I was wrong about the winner (so close); but at least in this overtime game, I was right about the point spread. Ole Miss would have struggled to win by more than 10 in overtime anyway. South Carolina lost but obliterated the point spread again. LSU and Georgia were the only two teams all season to beat them by more than two touchdowns, but other teams keep being favored by between 15 and 20. Of course, the former point might change with Florida and Clemson coming up. I was still wrong both ways with LSU-Alabama of course. Finally, Auburn still haunts me. It’s like they read this to decide whether they’re going to try this week or not. I was over .500 in both categories for the week, but 4-3 in picking winners isn’t very good. My overall record falls to 36-14, but my record against the spread improves to 20-27. I’ll take Arkansas and the points, but I think LSU will redeem itself slightly at home and manage to win. Georgia fans should be happy to know I will be picking Auburn to win and -1.5. I’ll take South Carolina and 8 at home but Florida to win. The Georgia and LSU games I mentioned were not played in South Carolina (theoretically LSU was a home game). I think Florida may be having some problems that will carry over. 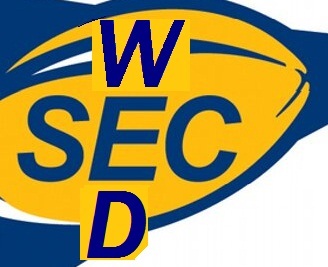 This is the Gators’ SEC finale, and Florida has already clinched the East, so the motivation may be lower than usual. I’ll pick North Texas +41.5. The Vols did beat Western Carolina by more, but the Mean Green does have an offense even though I realize they’re REALLY not a good team. I think it may go something along the lines of the LSU/Eastern Michigan game. Western Kentucky, probably the most similar team that has faced North Texas, won 55-28. Tennessee may hold them to 17 or 20 or something like that but probably won’t score more than the Hilltoppers did. Of course I don’t think it’s much of a question of the winner. I’ll take Mississippi St. +8. The last game the Tide played that wasn’t after a bye resulted in a close final score against that Volunteer team I mentioned. Mississippi St. hasn’t faced stellar competition, but the Bulldogs seem to be firing on all cylinders. I think they’ll get up for the game better. Starkville can be a weirdly difficult place to play if you don’t take control early. Kentucky has played so badly Vanderbilt is actually favored and deservedly so. I’ll even give the Wildcats the three points. Usually there isn’t a line for FCS games, but I’ll play along. A&M is favored by 35.5, probably due to scant point-scoring recently. I think they’ll wake up at least for this game though, so I’ll take them minus the points. I shy away from road favorites and from picking other teams to win in SEC stadiums, but I’ll make an exception for BYU at Missouri. The Cougars do have a common opponent with the Tigers, and that was Connecticut. BYU played terribly in that game and still won by 17, whereas Missouri only beat the Huskies by 3. Those games were very early in the season admittedly, but I also mentioned that the Tigers haven’t come across as very competitive in their last few games.